Everything is touch screen, so why not your calculator? 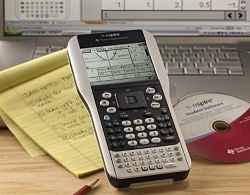 Texas Instruments today launched its touch screen graphing calculator, the TI-Nspire. The TI-Nspire comes with a new look and features a large screen with touch input. The new Nspire is loaded with features which include a PC software kit that allows users to export data and give them access to full color charts. The calculator runs on four AAA batteries however it can be upgraded to come with a rechargable battery which can be charged by your PC via USB. It shouldn’t be surprising that scientific calculators and others are all going touch screen. To push sales TI is also offering 25 minutes of free tutoring on Tutor.com for every purchase of its new TI-Nspire. The new touchscreen device is available at most stores and online for about $149.99.